While cross-pollination between the visual and the performing arts is, no doubt, of all times, during some periods it is much more intense and fruitful than during others. In the 1970s and 1980s, both performance art and the aesthetics of the visual arts, for instance, crucially influenced what later on became known as post-dramatic theater. And in the past few years, we are again witnessing a productive cross-fertilization. Visual artists make theater – or rather, performances in a theatrical context – and especially choreography is increasingly entering the territory of museums and galleries. Critics suspect this move of choreography towards the white cube is dictated by economics, as museums benefit from ‘eventizing’ their offer and, conversely, artists become ‘canonized’ by tapping into the symbolic capital of museums. In addition, the trend mirrors an economy that feeds off immaterial labor and a complete commercialization of the body. This doesn’t mean that there also genuinely – and interesting – artistic motivations to move between performing and visual arts. Cally Spooner is one of the few whose practice is truly post-disciplinary and whose oeuvre shifts from text over performance to film, as if they were different phases. The exhibition – or rather ‘expo performance’ – DRAG DRAG SOLO is a journey unfolding through the many galleries and floors of the Centre d’Art Contemporain in Geneva. 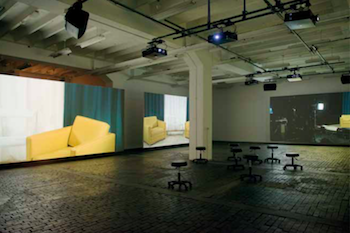 The first floor is devoted to And You Were Wonderful, On Stage (2016), a musical-slash-video-installation in which five big screens show the recording of a performance in a film studio from multiple camera angles. The screens form a square around the spectator, who is seated on a small stool with wheels. In one corner of the studio, three female dancers are performing a choreography that seems to suggest nothing more than the constant availability of bodies at and for work. In the other corners and along the walls, a green screen makes up an ad hoc set. The décor resembles a news studio, yet, as the performance progresses, it transforms into what seems like the set of a talk show. Still somewhere else, a polyphonic choir is singing almost non-stop. Fragmentary though the result may seem, it is nevertheless coherent. This ‘contemporary art musical’ features songs about public figures losing face after the discovery of a ‘fraud’: Beyoncé, who is caught lip-syncing at Barack Obama’s inauguration; Lance Armstrong, who confessed to doping in a TV interview with Oprah Winfrey; or Obama’s speech writer Jon Favreau, who traded the White House for Hollywood. Justin Bieber’s missteps, as well as those of British politician Michael Gove, are also covered. The video shows Spooner herself directing the entire thing in real-time, while technicians move scenery, build the set and dismantle it again. As befits a real show, the actions and performances in the studio are alternated with commercials. A recurring advertisement stars a job applicant who is continually corrected by his interviewer and given sentences to say – a humorous depiction of how, in the neoliberal world, the self is always performed, over and over again, following a competitive logic. Always sharp, always performing to the best of your abilities, using the right management speak: you are your own product, and hence not at all. Beyoncé doesn’t sing, Armstrong doesn’t cycle all on his own, presidents don’t write their own speeches, politicians don’t stick to their ideals, and so on. And You Were Wonderful, On Stage paints a picture of a reality peopled by stand-ins, by stars and individuals who are puppets, empty shells; it portrays a world in which appearing competitive is more important than how/who you are. In this installation, Spooner uses media from, and references to popular culture to create a critical, postmodern patchwork. This patchwork deconstructs itself through the different projection screens and camera angles that turn the film studio – and hence ‘the construction’ – into a vital part of the performance. It is telling that the name of tech philosopher Bernard Stiegler crops up in the film credits. On the one hand, he coined the term farmakon to criticize the repression and dumbing down that result from the commercialization of communication channels via new technologies, and on the other hand, he calls for a balanced approach to technology. Technology determines the way we think, communicate, remember and feel. Hence, in the hands of commercial and political bodies in pursuit of control and consumption, media technologies are manipulative and harmful. They distort our view of reality, they create bubbles and fake news, they distract us while undermining our memory. In this age of non-stop connectivity, we are never not working. Not only are we constantly sending e-mails; we are also building our personal brand on Snapchat, Instagram and Facebook – all companies (or rather: all part of one company) that managed to turn identity into commercial gold. Just like a vaccine (which is one possible translation of the Greek farmakon) often involves a small infection to elicit an immune response, Spooner deliberately gets infected in order to dismantle the mediatized, emotion-controlling and affect-saturated western ‘perform or else’-culture. Talk shows, musicals, advertising, …: her critique comes in exactly those formats that it criticizes the power and the contents of. The status of this work in Spooner’s oeuvre is fascinating as well. Before it became a video work, And You Were Wonderful, On Stage was performed live in museums like Tate Britain for three years (2013-2015), by a larger choir standing on a staircase. And yet another stage preceded this one, in which Spooner wrote the script, the lines that are sung. Text, performance and film: three media that are at the heart of Spooner’s artistic practice – and of the expo performance. Entering the next floor, you immediately find yourself in another kind of space, in another phase. Rather than visiting one finished installation, you’re confronted with a collection of (audio) installations, performance and video work. And though it’s impossible to see everything at once, different sensory impressions invite you to go and explore, and – above all – to draw connections. The first space contains a radio alarm clock (a stolen one, according to the accompanying sign) playing peaceful piano music. A story about a fake tear is written on one of the walls. In addition, three graph curves adorn the walls (the 2016 work Self Tracking (the five stages of grief)): one for the market value of the British pound, one for Spooner’s metabolism and one for her value on the art market. From a second, adjoining room, a voice counting in Spanish drifts in, as well as the sounds of someone being splashed with water (being waterboarded?) and a golf ball being hit (the audio work Soundtrack for a troubled time). Next to these visual and auditory impressions, there’s is a smell of soap coming from yet another room, where a man walks around tossing and catching a bar of soap, playing with it in his hands. Every now and then, he reads a couple of pages from a forthcoming Spooner publication out loud. They sketch a situation, but more important than the contents of the text is the action itself: a body is present while it speaks. The pages are strewn on the floor in heaps, with wax and bronze casts of Spooner’s ears serving as paperweights. A text to read, then, but especially a script to listen to – one that is embodied from time to time in the act of being read out loud. This room brings together several of the most interesting aspects of Spooner’s work, namely writing and the importance of language in performances. Her performance work arises from a writing practice and often serves as a ‘test’ for her texts, typically undertaken by ‘hired bodies’, as she calls them to underline the economic reality in which they also operate. Thus, the text turns into a script for a performance. In this room, you see and hear the transition from words on paper to a spoken, embodied performance. The word literally becomes flesh here: it becomes three-dimensional, it is given a sound and, thanks to the soap, even a smell. In the entire expo performance, the male performer is the only physically present, embodied voice. Mounted to the wall in ‘his’ space are two small speakers emitting female voices. One of them is Ivanka Trump’s, during an interview with Forbes Magazine on women and work. Sighs, moans and other sounds made by a woman with a cold who’s doing rugby exercises are coming out of the other speaker. He wins every time, on time and under budget (2016) creates a contrast between the sterile, corporate voice and words coming out from the then presidential candidate daughter’s mouth, and the physical, ‘dirty’ sweatiness of the rugby performer. The vain, empty management speak, showing language at work, and the fleshy, working and suffering body are like two sides of the coin of life in a neoliberal society. However, the flesh-and-blood-and-pain body is rendered invisible in a regime that philosopher-activist Bifo Berardi calls ‘semio-capitalism’: technology turns attention, language, creativity and knowledge into the new top products. Yet buried underneath and rendered invisible by the layer of immaterial labor lies not only a technological, but also a physical materiality. Spooner’s installations show and connect both and let you experience the divide between language and the body, between communication and politics. 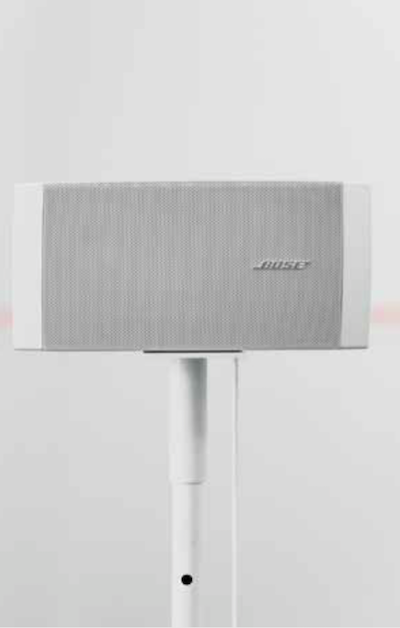 The speakers’ prominent presence (their brand, Bose, is even included in the description of the work – yet another creative appropriation of sponsoring and product placement) also immediately makes clear that it’s technology that facilitates and widens this divide, as well as making it available for commercial and repressive purposes. Spooner herself labels these kinds of installations ‘sound sculptures’. The sculptural aspect does not lie so much in the object itself – the slick design of the Bose speakers – but in the relation to a body. In the absence of the sniveling rugby body, emphasised by Ivanka Trump’s corporate, disembodied speech, the former nevertheless becomes present through a strong appeal to the imagination and an almost physical reaction to the sounds of sniffing and panting. But at the same time, the setup of the speakers – now you hear one, now another, as if there are two acoustic zones divided by an invisible barrier – makes the sound very physical, spatial and, in an intangible way, three-dimensional. The divide between body and language is most explicit in the video installation DRAG DRAG SOLO – which may be the beating heart of the exposition, though you have to wait until the fourth room of the second floor to see it. A big screen that is placed diagonally across the space projects a movie featuring three performers: one solo performer and a duo. The latter perform a choreography that wavers between fighting and hugging, between aggression and intimacy. The bodies in DRAG DRAG SOLO are silent – reversing the situation of the audio works: from acoustic, immaterial-yet-mediatized bodies to mute visually present bodies. Pure image, with no sound, it seems as if the squeaking of the shoes, the sighs and moans, the breathing and the rustling of the costumes have been blocked by the projection screen. DRAG DRAG SOLO, just like And You Were Wonderful, On Stage, followed on from a previous performance that ran for three months at the New Museum in New York in 2016, in which the actual, hired bodies of the performers were muted as they were isolated and put on display behind a glass wall. 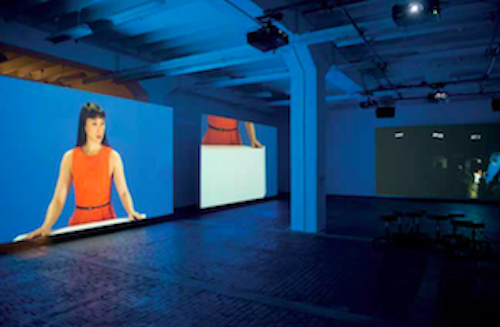 The sound that is missing from the video installation can be found in the spaces surrounding it. The rugby player creates a direct link with the struggling performers, but the other bodily noises – like counting, waterboarding, reading a script out loud, as well as Chopin’s romantic nocturnes emanating from the radio alarm clock – also suggest possible projections and connections. The result is a museum floor that is highly performative in its suggested connections and associations. If the previous floor was a ‘closed-off world’, then this combination of works is very open and ‘now’. The installations seem to be talking to each other, but the real connections between them occur live, in the visitor’s perception. Somewhere in a corner of the third and top floor, a female performer is doing stretches, dressed in leggings and a slim-fitting top. In the work Warm Up (2016), this exercising body occupies a small piece of grey dancefloor, underneath an accompanying text written on the wall. The act of warming up immediately suggests a link to the future. This body and its actions are not fixed yet; they are still looking for a stance to adopt, preparing to perform. Hence, the body does not yet occupy the space as a performative entity – in contrast to the talking, singing and choreographed bodies on the other floors. We’re witnessing a seed that is quietly wallowing and rooting, and is actually trying not to attract too much attention to itself yet. The seed that Spooner is carefully revealing here, is that of OFFSHORE, a ‘company’ in which she wants to further explore her position in creating and organizing working contexts and situations – as the artist herself explains in the text accompanying Warm Up. ‘Offshore’ seems to be a pun on ‘offshore companies’ established in tax havens, as well as on ‘going offshore’ or getting off the beaten path and leaving the safety of the shore. In her talk at KASK in April, Spooner confessed that her rhythm and methods put pressure on the people around her – which make not only her aesthetics but also the actual labor conditions part of the farmakon-balance structure. OFFSHORE, then, is not so much an ethical search for better working conditions, but a quest for collaboration, casting the consumerist regime of the visual arts aside in favor of a long-term vision, an action that wants to go offshore, escaping the clutches of commercialism. But that is something for the future. This ‘speculative event’ – to quote Spooner – once again features a ‘hired body’, a body in progress that is enacted in an exhibition context as an ‘object’ accompanied by a description. If the other works criticize the divide between body and language in a semio-capitalist world, presented in various case studies and sensory experiences, then OFFSHORE seems to be a search for an alternative. Perhaps this cannot ultimately be found in the works themselves, but rather in the working method. After all, the art market doesn’t mind a bit of capitalist, post-Fordist logic, as the graphs showing Spooner’s market value make abundantly clear, but in organizing her ‘company’, her work, Spooner tries to find a way to escape all this with OFFSHORE. Floor after floor, the body gains in presence: from a body captured on film in the video musical, to a mix of present and absent bodies on the middle floor, to a body looking and preparing for presence in Warm Up and the promise of a fusion of bodies in the announcement of OFFSHORE on the top floor. This evolution parallels that of a finished work, to works in progress that talk to each other, to the suggestion of a new work. The three floors, then, correspond to three time zones, running parallel in the oeuvre of one artist. I am certainly not the first to point out the connection between the recent trend to move performances and choreographies to museums and galleries on the one hand, and the emergence of eventization and the experience economy on the other. As a viewer, I seldom get the feeling that the artist in question made a conscious, content-based choice in favor of creating and showing a choreographic or performative work in a museum context. If the decision is not motivated by a desire for canonization, or by an institutional critique (though Claire Bishop, for one, argues that dance can never criticize the visual arts because it’s a different medium), then a recurring reason to perform a choreography in a museum – namely, to create something or an experience that is impossible to capitalize on – seems to turn into its exact opposite. By interpreting her expo as ‘somewhere between a retrospective and a rehearsal’22DRAG DRAG SOLO. Cally Spooner in conversation with Ginevra Bria, http://moussemagazine.it/cally-spooner-2018/, Spooner avoids this trap and succeeds in sharing her working method, and in incorporating the economy of performance in the contents of her work. There are three stages – from solid to fluid and ephemeral – that have a mutual dramaturgical connection in their relation to language and the body, from filmed post-Fordist labor to performed post-Fordist labor. Putting a body in a museum can be a last step on the road to complete commodification. The idea that body and mind have become reproducible products is underscored by the fact that they are on display. It’s precisely this dynamic that Spooner – by letting herself be infected in the way of the farmakon – can criticize across various media, without becoming excluded from it nor without this being included undermining her critique. This brings me to the final argument for a post-disciplinary (presentation of a) practice. Exhibiting living bodies, voices emanating from ‘boxes’, bodies behind glass, the detachment and objectification, also relates to life and death, to affect and emotion in relation to the socio-economic reality, media and technology that form the backdrop for life and death. Spooner herself labels the status of the various works in her expo as ‘varying states of aliveness and deadness that together create an ecosystem’.33Ibid. And indeed, DRAG DRAG SOLO has something of an ecosystem: the works are spatially clustered and have a temporal relation as well, both in the context of a single floor and of the exhibition as a whole. And just like Spooner weaves herself into the tapestry of the post-Fordist capitalization of the mind-body divide, you become a part of that ecosystem as a visitor. Despite the distance and the economic performativity which most works take as their subject, the result is lively, and a successful source of contemplation. Kristof van Baarle is a phd research assistant at the University of Antwerp and works as a dramaturge. Kristof is part of the editorial team of Etcetera.